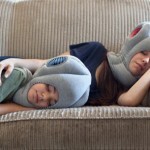 If you find yourself zonked at the most inopportune times, the Ostrich pillow might be right up your alley. Yes, this pillow has ear and breathing holes and of course, a giant hole for you to stick your entire head into. If anyone buys this for me for my birthday, I will love them forever, even if I hate them/don’t even know them now. That’s a pretty powerful proposition. I say you wrap your head around it. Or let it wrap… eh, too easy. Ostrich pillow! Buy here! It’s on your wish list now, right? UPDATED (April 23 2013): If you want a cheap knockoff of the same idea, get it here for $29.90 instead of $99US/CAD! Share the post "700 Posts! Whew, I’m Tired. Need Ostrich Pillow."